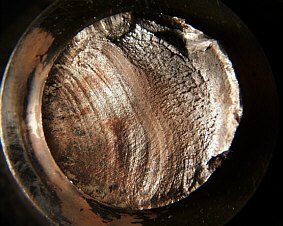 Forensic Engineering applies a variety of scientific skills and techniques in order to answer legal questions. 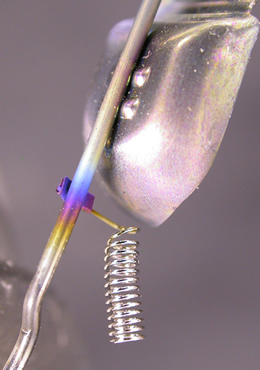 Our Forensic Engineers are highly skilled in bulb analysis and other automotive components. Read more about bulb failures here. Materials Technology regularly work for a number of police forces within the UK and have been appearing as expert witnesses for over 15 years in the area automotive fatalities. We have undertaken many road traffic investigations (RTA) to establish the effects of component failure or discover circumstances at the time of the accident. 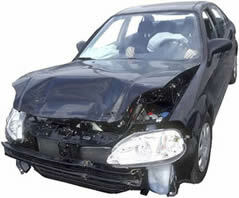 We conduct a variety of forensic examinations. Most of our cases involve fatalities and legal proceedings. Some typical examples of our work are included below. We also conduct accident invistgation work for commercial enterprises, private individuals, law firms, insurance companies, trading standards etc. In this area we analyse automotive bulbs taken from the scene of an accident in order to determine if the lights were on or off during the accident. The technique involves light microscopy work but sometimes involves the use of an SEM. This technique can be used to determine if cars or motorbikes were braking, indicating, dipping their lights or in many cases had no lights at all. The resulting evidence will then form part of the prosecution case against them. However, it can also be used by defendents to prove they did have their lights on. The photo at right shows the remains of a light bulb with evidence of oxide formation from the dipped beam filament. This indicates the dipped beam was on. Even broken bulbs and very small residues can be analysed. We look at filament breakage, oxide formation, glass residues etc to determine the state of the bulb. We have a vast database of historical evidence to call on. The remains of this bulb filament were examined to establish whether the filament was lit at the time of the accident. This example shows significant oxide growth demonstrating it was lit at the time of the accident. Unfortunately in many motorcycle accidents this is often the case and the cars often fail to see them. This investigation was performed to establish whether the rod assembly had failed prior to or as a result of the accident. Materials Technology were requested to establish whether the driver would have been aware of the fault prior to final failure. Sports car wishbone failure investigation aimed to establish whether the suspension failed prior to or as a result of the vehicle impact. 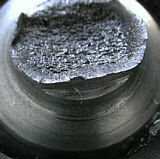 Materials Technology were able to show that the wheels inside rim struck an object during the accident resulting in failure.